Poor Carl. He had a near perfect love, with a near perfect love in his darling June. A day out at their favourite spot – a small jetty at a nearby lake - seemed idyllic. But fate had other plans, and the short drive home on wet roads ended in tragedy. At this juncture, many would enquire as to why they just didn’t walk the kilometre or so from home and level accusations of laziness. We’re not that nasty or heartless. So, Carl is left alone and crippled. He’s a determined soul, however, and thanks to the magic of his wife’s artworks (and a bit of fantasy application story-wise) he has the ability to pop back in time to events of that fateful day and change things. His hope is obvious, of course. He wants to prevent June’s death. Considering his fat head and lack of eyes, he also probably wouldn’t mind being able to at least be able to walk again, too. There are four significant players – a kid, June’s friend, a pleasant old bloke and a gun nut - whose lives you take over as you aim to put your world right. But there’s this thing called the butterfly effect, and it doesn’t really like being messed with. 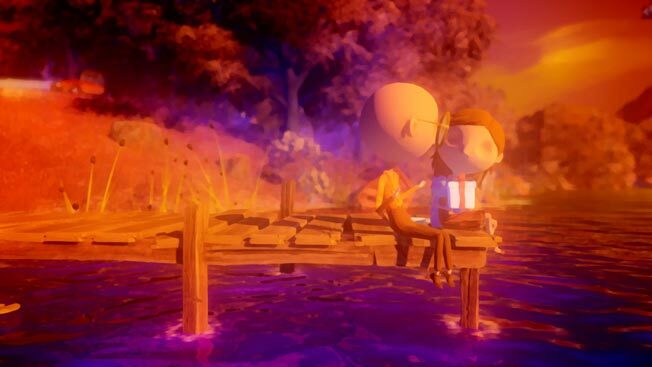 With much input from animator Jess Cope and muso Steven Wilson, Last Day of June is a treat for the senses, and visually quite unique. The story takes the odd cue from Pixar’s Up, and frames it all in a simple adventure format. Where things get more challenging is in working out ways to prevent one thing from breaking another thing that previously worked. Last Day of June is short, but it’s a sharp jolt of desperate love and loss that really tickles the heartstrings. So please, please, please let Carl get what he wants this time?